On view March 30, 2019 – May 5, 2019. Opening Reception Saturday, March 30th from 4-6pm. Impact marks a collision. Often it results from the colliding of objects, but impacts can occur between cultures, philosophies, financial strategies or changing natural environments. Impact usually relates to something we have done. With each new collision, we rush to mediate and minimize the effects, as if in an effort to keep change from taking place. The plaster castings shown here are records of the impacts of cars accidentally coming together. The folds, dents, rips and slices all occurred upon a violent, chaotic and piercing impact. 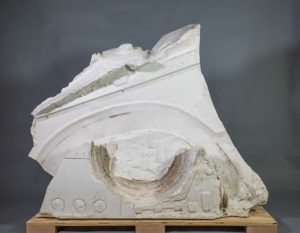 In contrast, the castings are quiet records; formed by the slow flow of suspended plaster, seeping into the folds and crevasses between the damaged car parts. The pieces are remnants of remnants. Their forms gently occur rather than being shaped or forged. These remnants recall the manner in which pieces of glaciers break off and fall into the sea. They are the passive results of a warming atmosphere colliding with the leading end of a creeping glacier. Glaciers move slowly, their growth so undetectable that we expect them to be eternal. We have named the chunks that break off “calves”. Calving has been naturally producing icebergs for thousands of centuries. Impact usually seems to be more associated with things on a human time-scale. Two cars swerve out of control and crash. Glaciers can’t keep up with the effects of our impact-oriented sensibility. Please join us Saturday March 30th from 4-6pm for refreshments and live music by Josh Connors and Otto Gardner. Gallery hours: Thursday – Monday 11am to 5pm, Friday 11am to 7pm.